I use Emacs for taking notes and project management using Remember-Mode and Org-Mode (see my blog entries Capturing and More. 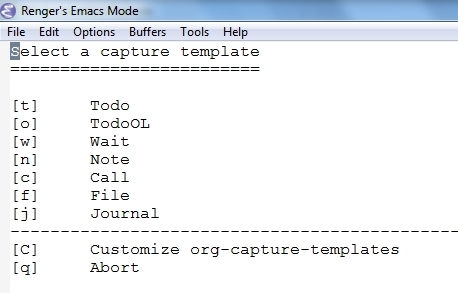 However, if I am working in Excel or reading a pdf , More and I want to make a note or I suddenly have a thought about a feature that I want to add to my model, I have to jump to Emacs,hit some keys, enter the note or the task and navigate back to the program I was working in. Not much of a hassle, but inefficient as it really interrupts my work flow too much. No problem, if you use some macro scripting tool (for example winautomation or autohotkey) it is rather easy. I then choose the template (for example t for ToDo) and enter the information. I quit with C-c C-c and my entry is saved. Then I hit Ctrl-g (which is the Emacs command for “break” and in this case does nothing and if I change my mind and don’t want to save the note or tasks it stops the remember mode). This keystroke combination is used as a trigger for the Winautomation macro to return to the macro. In the last step the focus jumps back to the program I was working with. The macro is started when I hit the hokey “Ctrl-Shift+F11”, which I defined in Winautomation. As I have the professional version of Winautomation, I can generate an executable and send it to you. Just mail me at renger(at)modelworks.ch. For this you can use free programs like winkey (on Win32) or HotkeyBind (I did not test these programs).